Metropolis plans its litters years in advance. We prefer to meet with potential buyers and to compile a waiting list in anticipation of breeding. This enables us to ensure that buyers have sufficient information, and are properly prepared for providing a home for life to a Metropolis vizsla. It also removes any pressure or impulse buying associated with cute puppies, as opposed to the gorgeous adult dog you are likely to have for 12 – 14 years. 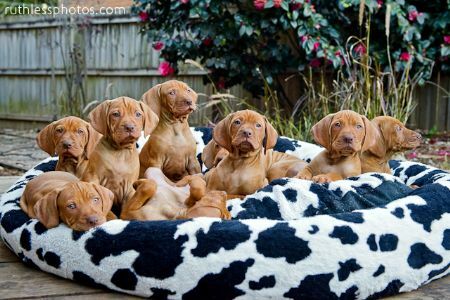 If you are interested in providing a home to a Metropolis vizsla, please email metropolisvizslas@gmail.com (our preferred contact method), or call Robyn on 0410 60 4238. We prefer not to publish photos of our pups until all have gone, or are close to going, to their new homes. When possible, we organise professional photographers to photograph our litters, who provide photos and photo packages at a very reasonable price. Photos on this site of our pups are generally of previous litters. The photo on this particular page is by professional pet photographer Ruth O’Leary of Ruthless Photos, and is our first litter, with Ch Metropolis Avant Tout as a pup.